This addon is an enhancement to concrete5 eCommerce, and facilitates the download and mass update of product details including prices, tiered prices, special price, quantity, status, minimum quantity, weight, weight units and login to purchase. 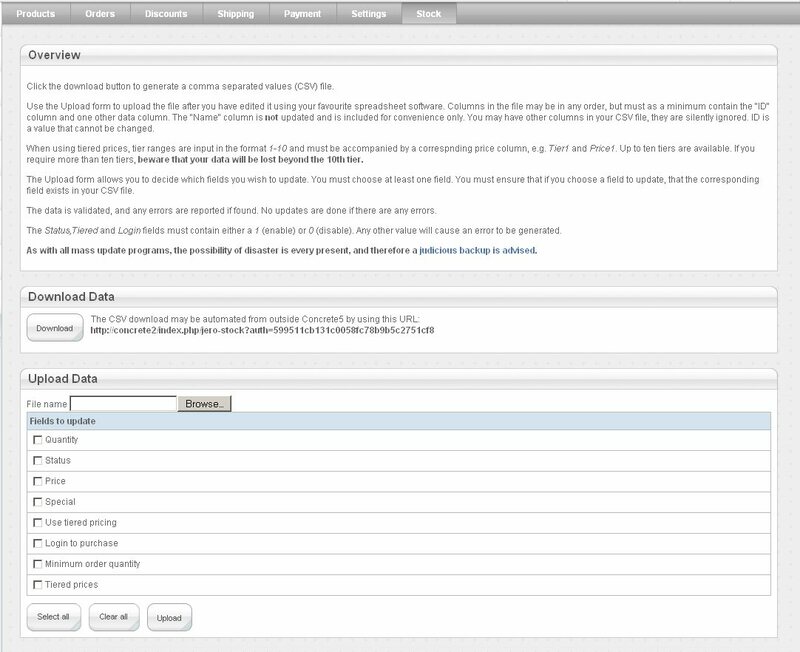 It uses the core commerce classes to do the update and adds an additional "stock" tab to the core commerce dashboard. Please note that this addon updates products, product attributes and product sets. It does not update orders, invoices or anything else. If you need to update anything other than products, then this is not the droid you're looking for. Move along. Additionally, the CSV file may be downloaded automatically from a single page URL, allowing current stock levels to be managed by external systems. A dashboard job is added, which looks for a specific file and imports it. Typically this file wil be uploaded by FTP or some other mechanism. The CSV file generated may be manipulated by any spreadsheet program, such as Openoffice.org or Excel. The fields in the file sent for upload may be in any order and some may be omitted with the exception of the ID field, and at least one other field. This allows the update of just one field and doesn't require the user to replicate the file format exactly. This makes the task of importing upload data from other systems considerably easier. Error checking is performed on the contents of product fields, and any errors will cause the import to abort without changing any values. The user can choose which fields to update, but must make sure that the corresponding fields are in the file uploaded. The addon supports up to 10 pricing tiers, but will erase data beyond that. It's easy enough to up this limit, but 10 seemed like an adequate value. Note: Version 2 or later of eCommerce is required. The addon has been tested and works with Concrete5 5.5.1 and eCommerce 2.5. A demonstration site is available at http://jero.net.nz/. User name is "demo", password is "concrete5".